Hey there. Basically, this page is intended to inform our readers (that’s you) that any and all information on this site is pure bull excrement. The topics and material on this site may offend and disgust some viewers. If this is the case, please disconnect your device and move to an off-grid hut in the Amazon rainforest. This site is for pure entertainment purposes only and should not be at all relied on for accurate information. This site is satirical, contains completely fictitious content and any and all characters, events, places and institutional names mentioned within are only mentioned in a comedic context. So take a minute to read this disclaimer. . .
Said posts or stories may or may not use real names, always in semi-real and/or mostly, or substantially, fictitious ways. 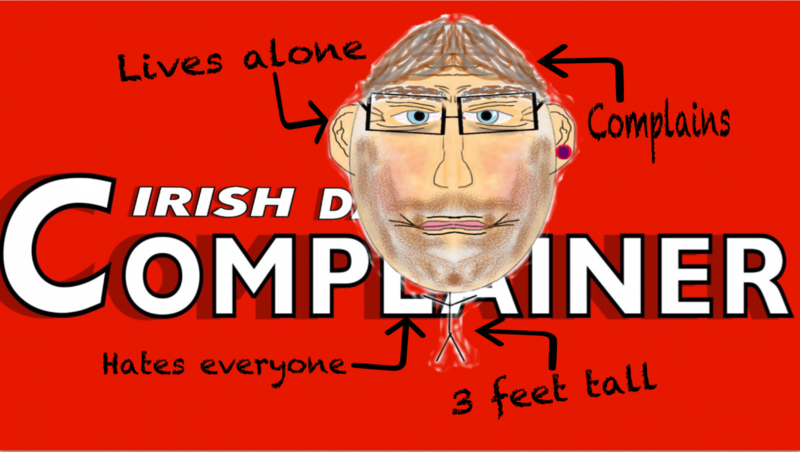 Therefore, all news articles contained within irishdailycomplainer.com are works of fiction and constitute satire news. Any truth or actual facts contained in said stories or posts are purely incidental or coincidental and not intended to be, or be construed as facts. Any resemblance to the truth or actual facts or to reality is purely coincidental, except for references to famous persons and/or public figures, in which case such stories are based on real people, but the story, or stories, surrounding or about these people or figures are almost entirely fiction and are intended as satire and entertainment. As the purpose of said stories is to entertain and amuse and not to disparage any persons, or institutions, in any way and no malice is intended toward anyone or anything, nor should any be construed from the satirically based stories and fake news items. This website is not a source of facts or real information. That means all items or stories on this website are fictitious. Any resemblance to persons, living or dead, is entirely coincidental or is intended purely as a satire, parody or spoof of such persons and is not intended to communicate any true or factual information about that person. The information contained in this website is for entertainment purposes only. Through this website, you are able to link to other websites which are not under the control of irishdailycomplainer.com. We have no control over the nature, content, and availability of those sites. The inclusion of any links does not necessarily imply a recommendation or endorse the views expressed within them. Every effort is made to keep the website up and running smoothly. However, irishdailycomplainer.com takes no responsibility for, and will not be liable for, the website being temporarily unavailable due to technical issues beyond our control.